- Shot with Canon 100mm Macro, handheld. - Existing light, no flash fill. Damn that is a good image! So clear and crisp! I'm in awe! a well deserved ribbon...this is sensational. great choice of lens for this. Man, how do you pull off these shots hand-held? 100mm with no flash; I really don't detect any shake. You camera must have one fantastic image-stabilization system, or you must be built of stone. Great work! beautiful picture. the colors are amazing. This is one of the most beautifully done macros I've ever seen! The colors are so vibrant and clear, and his posing is fantastic! This is an awesome shot....I love it! Although the color is fantastic, the framing and the angle of the shot make this a very dramatic picture. Excellent work! Congrats on the ribbon Fritz! Wow, thats such a breathtaking shot. Very nicely done:) Congrats on your ribbon! Congrats!!!! Well deserved ribbon! Well done! I absolutely love the angle & expression. Paired with the colors, it's just awesome! Congrats! Message edited by author 2004-04-08 14:38:25. Wonderful shot, impressive composition and colour. I gave you a ten! My 12 year old son just loved this shot! Congrats on your ribbon. The colors!! You can get lost in them. You've got a steady hand. Impressive work. wow - great colours and clarity. Very arresting shot. Message edited by author 2004-07-28 21:59:21. Simply stunning! What a grand bird and what a great job you did at getting close. Fabulous. I knew this had to get a ribbon. It was one of my top picks. Congrats. He is so cute! it´s the best bird shot in this challenge, Congratulations! Great shot..congrats on your ribbon..well deserved. Fritz, this is good stuff! Congratulations on your first ribbon--the first of many to be sure! Thank you DPC voters! My first Ribbon! YES!!!! Wow! Congratulations! It's my favorite in the whole site. Absolutely superb... I haven't gone through all the photos yet, but I can't image I'll find one I like more than this. Wonderful colours and saturation, very imaginative composition, great clarity. I love the blue eyes. Wonderful color and detail! And I love the expression on his face. Great capture! Outstanding work. Excellent contrast and color. This intimate shot almost becomes abstract with this crop. DOF and background color terrific. Fantastique! The hues and saturation are awesome. The composition is original and fitting. Fabulous color and detail! Very impressive! 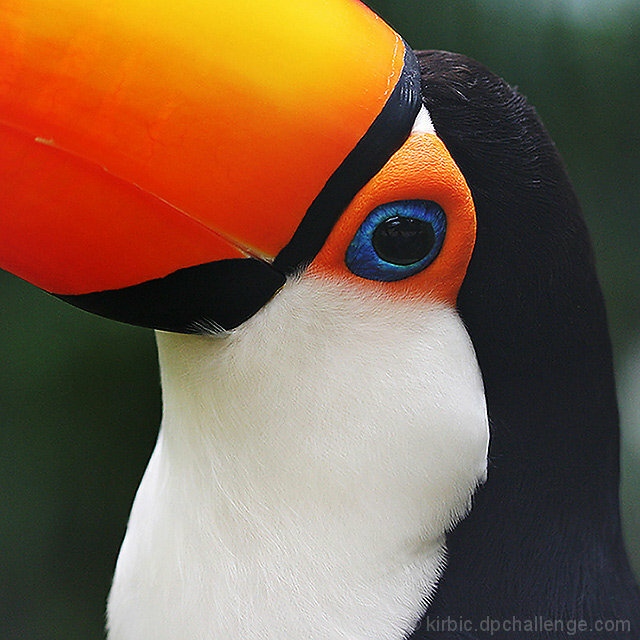 8 - If this Toucan You Can! Nice shot! Beautiful color and detail. Interesting picture because of composition. Heh; he does look surprised. Spectacular color, and I love the framing. These are such bizarre birds. YOur focus is perfect. Every detail sharp. There is a wistful look in the bird's eye. Definitely in the tops---great sho...the light is a little harsh on the top of the beak near the head but besides that, I love thes hot. Gorgeous work all the way around. Sorry I don't have anything constructive to say--this is just simply beautiful. Good luck. Teriffic! Is this a live Toucan? I would have been very tempted to clone out the blemishes on the beak etc. Beautiful photograph. Hope you get the place you deserve. Wonderful color and detail. Great close up. Your focus is just right on. A masterpiece of impressionism on this subject matter. Amazing contrast and color study. Where did you snap this? fantastic color! excellent crop and a great shot overall. perfect detail, composition, exposure....The DOF is good, but the background might have been a bit brighter as its color and shade do not accentuate the birds iamge at all. Otherwise great shot! Proudly hosted by Sargasso Networks. Current Server Time: 04/20/2019 08:15:58 PM EDT.